The Bromeliad Society of Australia will hold their next meeting at the Federation Pavilion, Castle Hill Showground on Saturday, 14 July with plant sales commencing at 11am prior to the meeting. Access is via the new Showground entrance off Showground Road into Doran Drive, Castle Hill with plenty of parking on site. 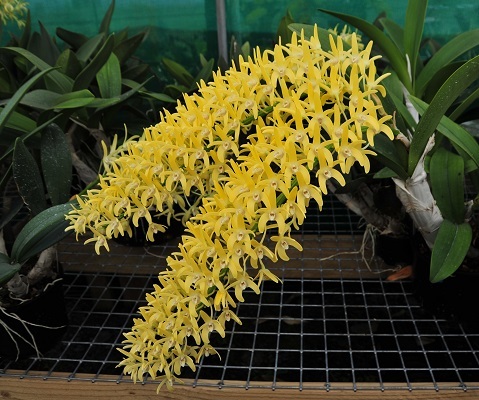 Guest speaker George Oehm has been growing orchids for about 15 years, commencing with cymbidiums and 10 years ago after joining ANOS Central Coast Group he became very passionate about native Dendrobium Hybrids. He is currently busy as the Chairperson/Coordinator for the Wyong Spring Orchid Festival – being held during September at Wyong Race Course combing 4 orchid clubs, several orchid vendors and six Lifestyle Groups. Although, a primarily Australian Native Orchid grower George does have a number of other genera that he also grows and this talk will include a variety of orchids and how to look after them. • The importance of changing potting mix on a regular basis. Specific orchid types, phalaenopsis (moth orchid), cymbidium and cattleya/speciosum are from different countries they require similar growing conditions. There will also be some of George’s orchids for sale at the meeting. BSA meetings include interesting guest speakers, plant sales, club news, raffles and competitions as well as providing an opportunity to meet with like-minded people in a friendly and inviting environment.